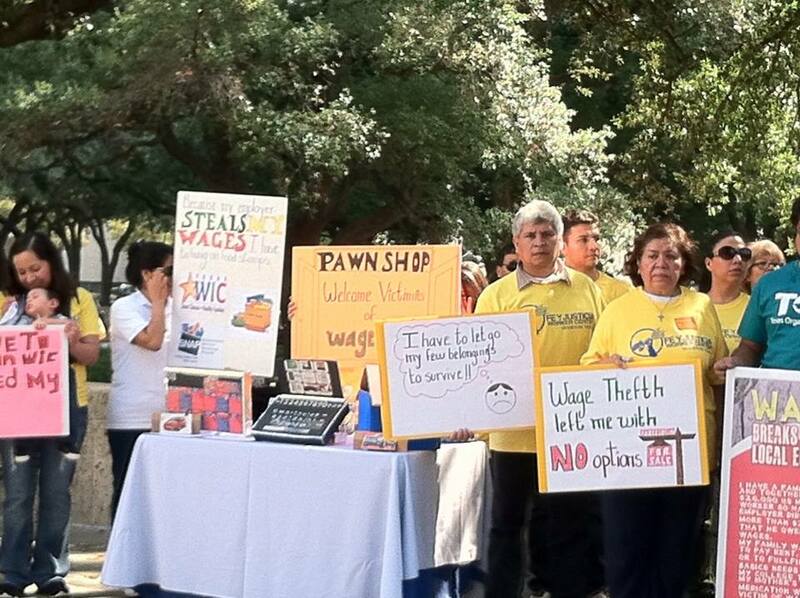 Blog | Down With Wage Theft Campaign | Bringing down wage theft & making Houston a just and prosperous place to work! 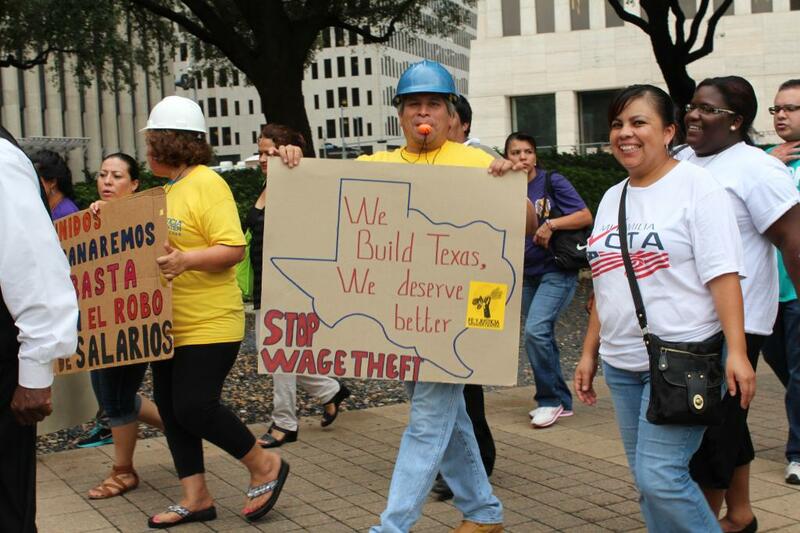 Today, Wednesday, November 20th, 2013, Houston City Council made history passing the first municipal ordinance cracking down on wage theft in Texas and only the second in a major metropolis in the U.S. South. The measure passed unanimously. 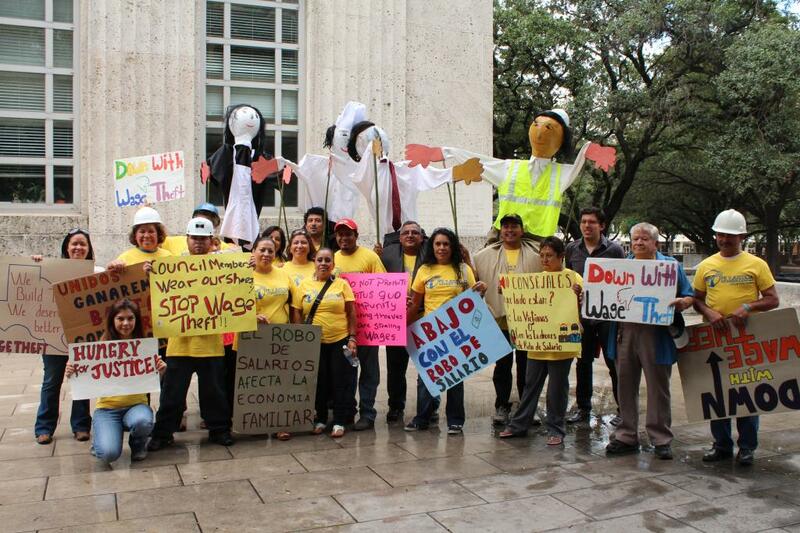 In passing the Wage Theft Ordinance, Council sends a clear message that intentionally cheating workers of their pay – especially under city contracts – will not be tolerated in Houston. The ordinance establishes a process housed in the Office of the Inspector General through which employees can bring wage claims forward. Companies with a documented record of wage theft – either final adjudication from a court of competent jurisdiction or a criminal conviction – will be included in a publicly listed database on the City’s website and will be ineligible for city contracts or sub-contracts. Additionally, any company with a criminal conviction of wage theft will be ineligible to receive occupational permits and licenses. The legal language of the ordinance was developed as a public policy proposal incorporating the demands and vision developed collectively by low-wage workers employed in various industries that had direct personal experience with wage theft. Members of the Fe y Justicia Worker Center, the organization spearheading the Down with Wage Theft Campaign, prioritized the need to increase real consequences for companies and employers that demonstrated disregard for the dignity of workers and wage and hour laws. The ordinance was then submitted to Mayor Parker and promoted in Houston neighborhoods by constituents in each of the city council districts. Over the past two years, members of the Fe y Justicia Worker Center have educated the public and Council on the social and economic impacts of wage theft by taking to the streets, convening community forums, and meeting with City Council members, business owners, and community members building a coalition of over 35 organizations. 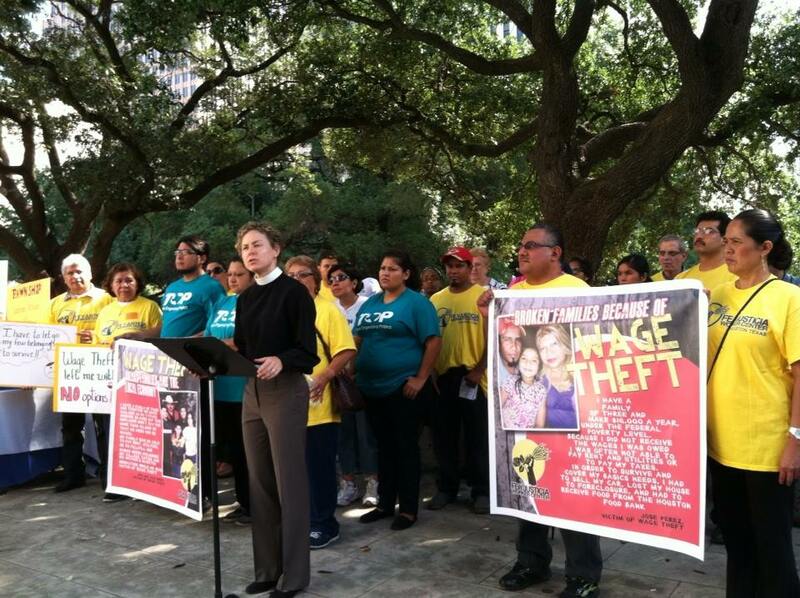 In the Houston area alone, it is estimated that over $750 million dollars are lost due to wage theft among low-wage workers every year. Low wage workers must often seek recourse from community services or government assistance as their poverty is further exacerbated due to the loss of wages when experiencing medical emergencies, lack of food or shelter, and other needs. Houston, TX. The City of Houston, the 4th largest city in the United States, second only to New York City in the number of Fortune 500 headquarters, which as an independent nation would rank as the world’s 30th largest economy has the opportunity to set a historical precedent on November 13th. 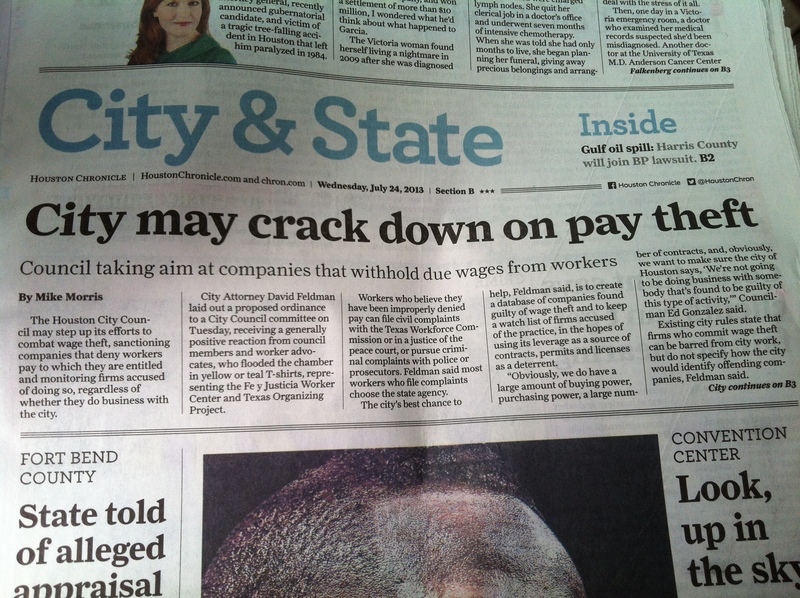 The likely passage of the proposed Wage Theft Ordinance would make Houston the first city in Texas and only the second major metropolis in the U.S. South to implement real consequences for companies found guilty of wage theft, thus leveling the playing field for ethical businesses that are at a competitive disadvantage against unscrupulous employers. “As you can imagine, wage theft affected my life emotionally as well as financially. Eventually my dreams vanished as my rightful wages from years of hard work were stolen by an irresponsible employer,” commented Jose Perez, a husband and father who lost his home to foreclosure and was forced to sell his car because he did not receive his earned pay for residential construction work. 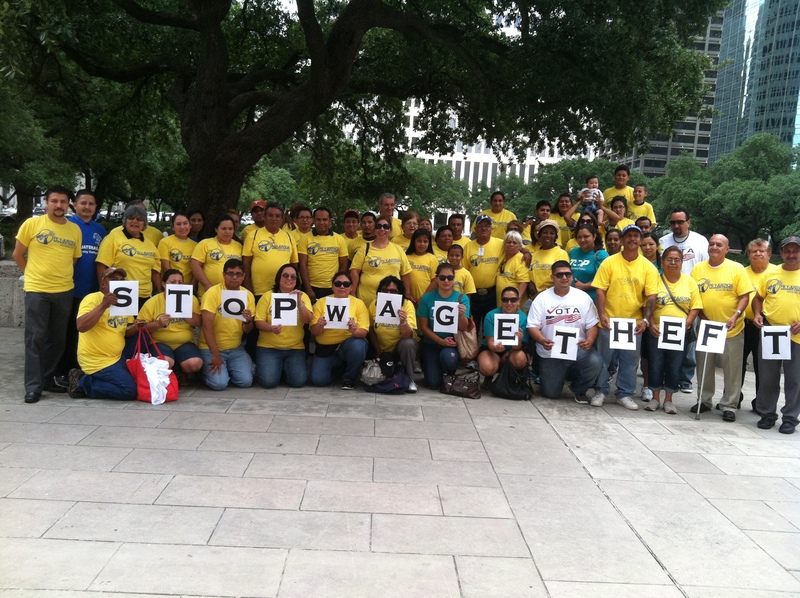 Perez and other Houston working families started organizing two years ago to demand City Council take a zero tolerance approach with companies engaging in wage theft. Their dedication is finally paying off with a vote on the proposed Wage Theft Ordinance anticipated for Wednesday, November 13th. The ordinance has been vetted through two Council Committee Hearings and prohibits the City from doing business with companies found guilty of wage theft. Despite Houston’s overall economic strength and growth, many working families struggle to make ends meet. More than 100 wage and hour violations occur each week, affecting workers employed across multiple industries. A recent report estimates that more than $753 million in wages are illegally withheld from low-wage workers in the Houston area each year and nationally studies found that 68% of low-wage workers experienced wage violations each week. U.S. Department of Labor. Wage and Hour Compliance Action Data. “My father worked as a truck driver but his employer didn’t pay him more than $2000 dollars that he owed him on wages. My family was not able to pay rent, utilities, or to fulfill our basic needs including my college tuition or my mother’s diabetes medication while he was a victim of wage theft” said Adalinda Guajardo to City Council Members this past Tuesday, October 15, 2013. 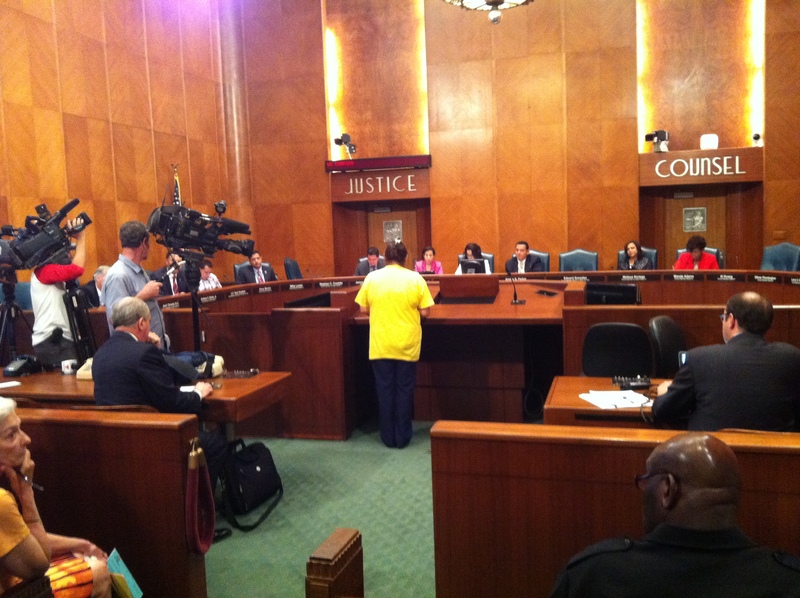 To Adalinda, justice for wage theft is necessary for the overall wellbeing of Houston communities. After two years of diligently pursuing a strong public policy that establishes real consequences for employers that steal wages, 70 participants from the Down With Wage Theft Coalition, which is spearheaded by Fe y Justicia Worker Center and includes business, community and religious leaders, held a press conference and satire outside of City Hall, demanding City Council Members to publicly declare whose side they are on. Participants performed the satire to emphasize the reality many low-wage workers face when they are victims of wage theft as well as highlight the direct and indirect impacts of wage theft on the local economy. A booth was set up with CHIP, Food Stamps (TANF), and WIC applications to accommodate the need for government assistance when workers already living under the federal poverty level are driven further into poverty. The booth also held items ranging from laptops and TVs to jewelry for sale in a mock pawn shop as many low-wage workers are forced to resort to pawning their possessions in order to make ends meet when they are victims of wage theft. After the press conference, participants marched to the City Annex to meet personally with City Council Members asking for their commitment and support for the proposed ordinance. Staffers from District A’s Helena Brown, District F’s Al Hoang, District J’s Mike Laster, and At-Large 2 Andrew Burks were greeted in the hallway by members of the coalition, including many who have been personally impacted by wage theft, shared their testimonies with Council Members and their staff. 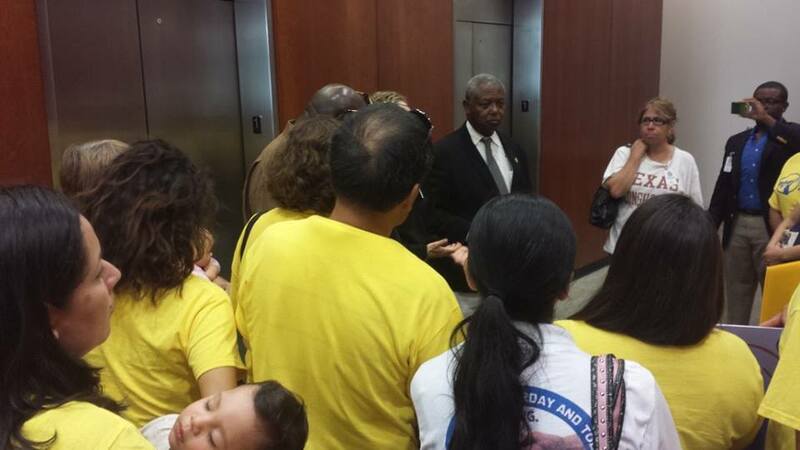 Council Member Burks embraced the participants’ zeal for justice and invited the group into his office and committed to support the Anti-Wage Theft Ordinance. Afterwards, at the City Council Public Session, low-wage workers shared their testimonies and the effects wage theft has had on their families’ lives and economic stability. Adalinda Guajardo, the daughter of a victim of wage theft, presented Council Members with over 1,000 letters she and other FWJC members collected in their respective districts that stated support for the Anti-Wage Theft Ordinance. 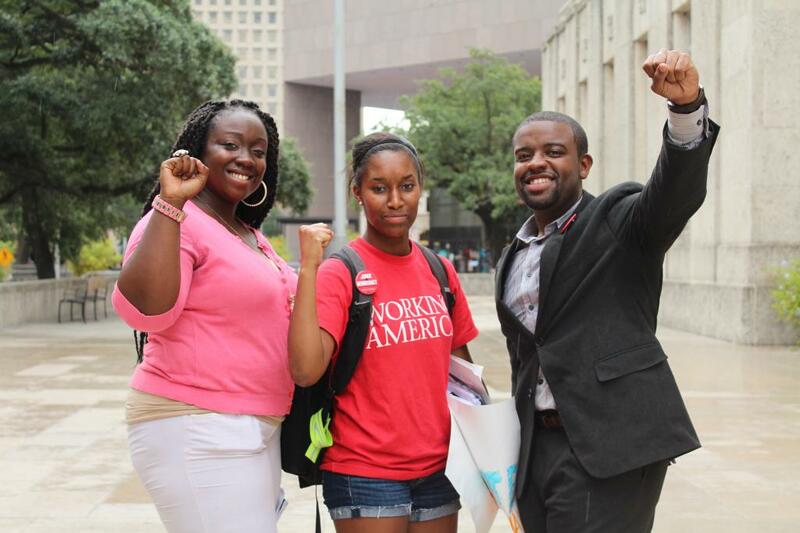 Durrel Douglas, Texas State Director of Working America, also presented to Council Members over 1,000 handwritten letters by thousands of Houstonians who are demanding City Council act now and support the ordinance. 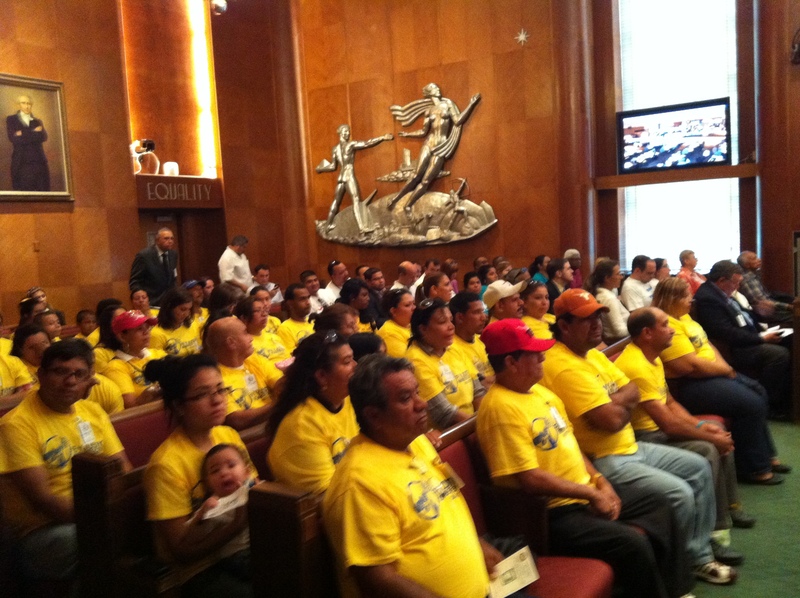 The Wage Theft Ordinance has been met with grand fervor by the Houston community. If passed, the proposed Anti-Wage Theft ordinance would make Houston the first city in Texas and the 2nd major metropolis in the US South that would create real consequences to companies that have a documented record of failing to pay their employees their legally owed wages. On its third and likely final draft, the ordinance is expected to be up for full Council vote within the next few weeks. On Thursday, September 19th business industry leaders and working families gathered in front of City Hall to draw a line in the sand, demanding Council Members to publicly declare whether they will stand up to support a desperately needed Anti Wage Theft Ordinance or protect the status quo of impunity for wage thieves. In the Houston area alone, more than 100 wage and hour violations occur every single week, affecting workers employed in multiple industries. A recent report estimates that more than $753 million in wages are illegally withheld from low-wage workers in the Houston area each year. 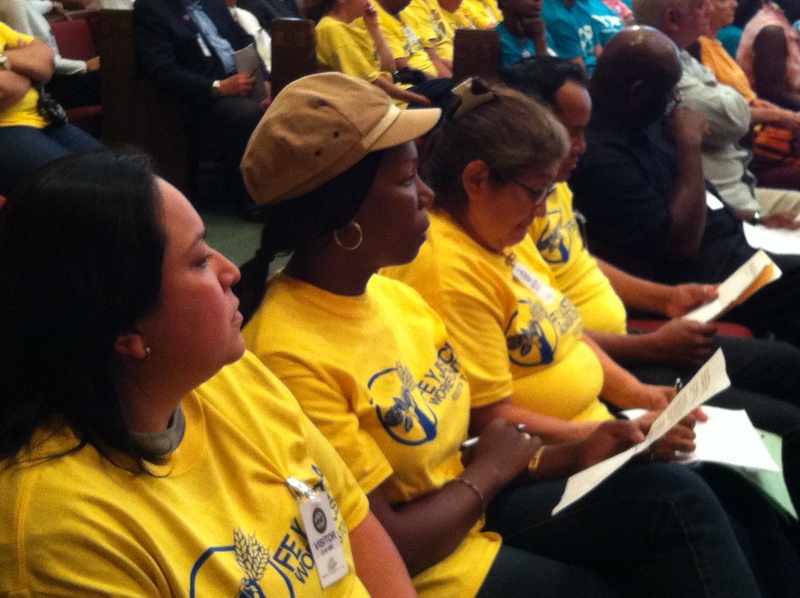 The proposed Anti-Wage Theft ordinance has been through two Council Committee Hearings with ample support and presence of responsible business owners and community members. Houston would be the first city in Texas and only the 2nd major city in the U.S. southern states to pass an ordinance addressing wage theft. 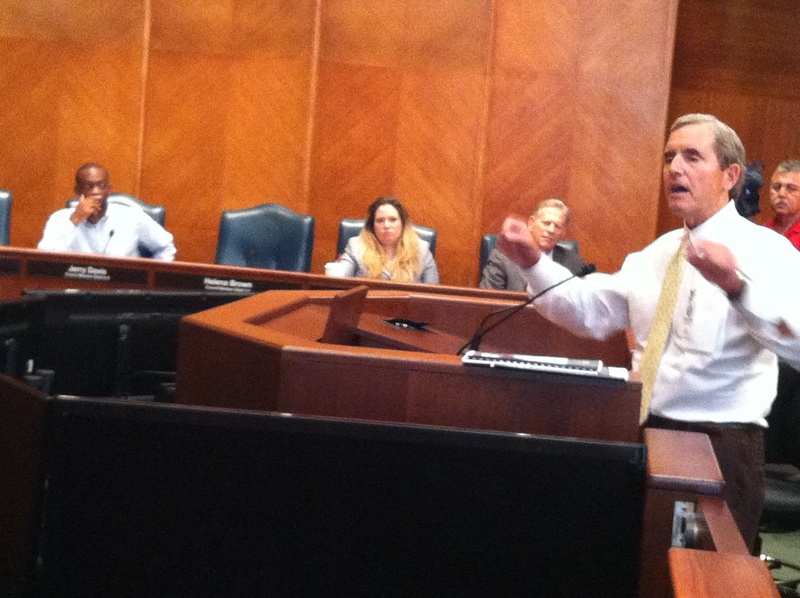 If passed, the proposed Anti-Wage Theft ordinance would prohibit the City of Houston from doing business with any company that has a documented record of failing to pay its employees their legally owed wages with an agency or court that enforces wage and hour law.